My vintage perfume collection (found mostly on eBay, sometimes in flea markets) is starting to take alarming proportions. This is a short list of my favourite vintage perfumes. I’ve only included those that I actually own, in pristine condition (which leaves out quite a few). When a current version exists, and I’ve made the comparison, I’ll say so. So this is in no way a comprehensive list. Only a small selection based on my personal experience. I’ll be reviewing this as I go along. 1. Jacques Fath Iris Gris, Vincent Roubert (1947). Is it as beautiful as it’s made out to be? Yes. It might be relaunched in some foreseeable future by Parfums Panouge, who’ve just bought the licence for Jacques Fath Perfumes. 2. Coty L’Ambre Antique, François Coty (1910). An ode to amber underscored by mulled fruit notes. 3. Coty Chypre, François Coty (1917). The brutal, Fauvist forerunner of Mitsouko (which I tend to prefer). 4. Balenciaga Fleeting Moment, Germaine Cellier (1948). An aldehydic rose-jasmine underlined by unusual aromatic notes of thyme and tarragon. 5. Lanvin My Sin, Madame Zed (1925). All fragrances in one: aldehydic, floral, woody, animalic. 6. Lanvin Scandal, André Fraysse (1933). The leather lover’s Holy Grail, aldehydic, supple and animalic, highly admired by the great Edmond Roudnitska, no less. 7. Guerlain Cachet Jaune, Jacques Guerlain (1937). Jean-Paul Guerlain’s mother wore this beautiful ambery vanilla laced with cinnamon. It seemed for a while that Guerlain would re-edit this (it’s in the “microwaves” at the 68 Champs Élysée shop) but doesn’t seem to be in the program. 8. Guerlain Djedi, Jacques Guerlain (1927). Dry, leathery, dusty, aromatic vetiver, the epitome of dryness. Relaunched as a limited edition in 1996. 9. Guerlain Parure, Jean-Paul Guerlain (1975). A lovely floral chypre with plum notes. Could be relaunched (according to its author), but not programmed yet. Will certainly be de-oakmossed. 10. Hermès Doblis, Guy Robert (1955). The reference leather. Relaunched as a limited edition in 2004. No foreseeable re-edition, according to Hermès. 11. Jean Patou Moment Suprême, Henri Alméras (1929). Surprising lavender top note dressed in flowers and amber. 12. Jean Patou Colony, Henri Alméras (1938). A pineapple-topped chypre, as lusty as Carmen Miranda. 13. Le Galion Tubéreuse, Paul Vacher (1937). The forerunner of Tubéreuse Criminelle, totally modern with its minty camphorous top notes and its oak moss base. 14. Bienaimé Chypre Impérial, Robert Bienaimé (1935). Dry, aromatic (bergamot, clary sage, tarragon), on an Animalis base. A rare find. 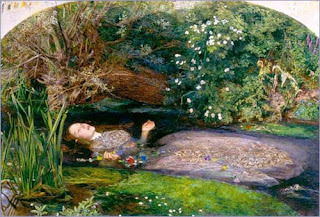 Image: Sir John Everett Millais, Ophelia, (1852), Tate Gallery. You know my profound feelings on Djeji, Doblis and the discontinued Patous of course, as I was quite mouthy in my reviews already (LOL)! But Parure was something I never understood why it was pulled. The re-issue in the bee bottles didn't sell? Of course there is some slight difference with the previous version; I am lucky enough to have secured an old bottle before that. Shame if they de-oakmoss it, though. It just won't be the same! 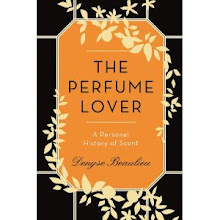 E., Parure has not been re-issued in the bee bottle: for the moment, the only thing I've heard of it was by Jean-Paul Guerlain himself, whom I met last April at a book festival. It's not scheduled for 2008. But Mr. Guerlain said he was reformulating it, which points to de-oakmossing. I think it was pulled for two reasons: 1) it was not such a good seller and 2) it had oak moss but wasn't enough of an institution to go through too much trouble, unlike the public outcry caused by Mitsouko, thanks to Dr. Turin. JP Guerlain vous aurait-il dit qu'il avait modifié Derby ? Je ne le retrouve pas identique à mon souvenir de la fin des 80's. 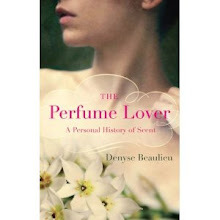 I'll answer this one in English: I only met M. Guerlain briefly before a formal dinner, and couldn't bring up Derby. I've never smelled the original so I can't say about reformulation, but I find it outstanding as it is. Such immearurable loveliness- olfactory art. I can only rejoice that we're onto the same vibes across the Atlantic! If you should ever come to Paris, you know you've got your private Carmenothèque visit! I MIGHT just take you up on it ! Would love to see Parure relaunched but the thought of it being de-oakmossed makes my heart sink. Billy, I did discuss Cachet Jaune with M. Guerlain because I was actually wearing the few drops (given by a friend) that I owned... I was totally sucking up to him! But alas, no forthcoming reissue. Sous le Vent is in the same ballpark, with lavender on top. It's actually great in summer. I've seen the Kadine. I'm not bidding on that type of stuff anymore, the bottle collectors just drive the prices up like crazy, especially for well-known stuff like Guerlain. Plus, I've had bad surprises with stuff wrapped in boxes (spilled inside with no way of knowing it). Ooh, that's disappointing! Did he actually say that plans for the Cachet Jaune had been scrapped, or did he just leave it ambiguous? 3/ I was on a buzz because I'd just learned that my book had received an award. But more seriously, M. Guerlain's position in the house is a bit delicate: because of his age and health, he's kind of being edged towards the exit, I think, and might not have an enormous say in what comes out or not... So I couldn't really insist. My list is mostly Caron perfumes, Narcisse Noir, En Avion, Tabac Blond, N 'Aimez Que Moi... I don 't buy the present reformulated Caron versions, instead I spend a fortune trying to score well preserved bottles on ebay. I've omitted the Givenchy III and both the Balenciagas in this list because they're still around. The re-edition of the first is not identical, but all right. I haven't smelled the Balenciagas at Roja Dove's, but they're still around, though hard to find. of course Parure had been re-issued in a bee bottle, a while ago! It was when almost everything got issued in them, LOL. Guess it did not, just like you surmiss. Now it goes for a pretty penny. We're lucky I guess, although I love it more than you. Ok, *that* bee bottle... I was thinking of the Les Parisiennes collection which now hosts most of Jean-Paul Guerlain's fragrances, and which is the non-atomiser bee bottle. Yes, of course, that's the last form in which Parure was sold, and the current one for Après L'Ondée and Chant d'Arômes edt. Thanks for clearing up the mix-up! I think I'll kill myself now. This upcoming-but-then-again-not-really ballet with the Il Etait Une Fois collection is driving me insane, I swear. Last time I talked with the ladies at the Champs, Ode was "to be released, but they've been saying that for three years". Joy. Six, I have exactly two drops of Cachet Jaune left. I had a couple of milliliters. I used up most of them when I knew I was meeting Jean-Paul Guerlain, at a book and wine festival. He said he could get me some more. I'll be taking him up on that. It's a wonderful scent.